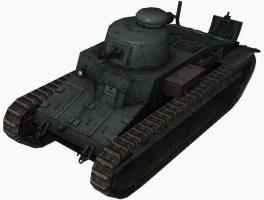 The D1 is a French tier 2 light tank. Development was started in 1929. Mass production was launched in 1930, with 160 vehicles manufactured by 1935. 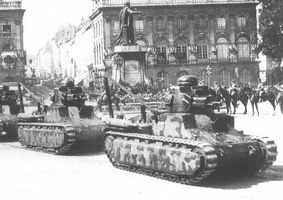 A total of 152 tanks fought in France. Eighteen vehicles were captured by the German Army and used for training purposes. 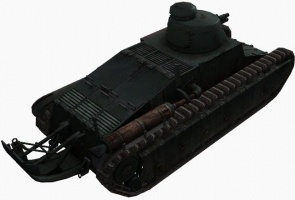 The D1 has better armor than the Renault FT, but is heavier and has a weaker engine so it has much worse mobility. With the exception of the 47 mm SA 34, the D1 retains the same gun selection as the FT. Physically, it is much larger than the FT. The D1 leads to the D2. 18 degrees of gun depression - one of the highest in the game! 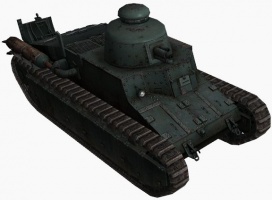 Designed long before World War 2, the D1 was designed as an infantry support tank. As such, it has pretty decent armor, but it is incredibly slow and considerably undergunned. 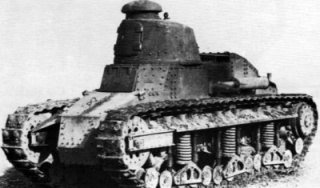 All of its guns, except the 47 mm SA34, are carried over from the Renault FT starter tank, which basically forces the D1 to choose between relatively high damage but abysmal penetration guns such as the 13.2 mm Hotchkiss mle. 1930 heavy machine gun, the 37 mm APX SA18, and the 47 mm SA34, or the high penetration but low damage 25 mm Canon Raccourci mle. 1934. The 47 mm SA34, in particular, has the worst penetration of any single-shot tank gun in the game. If armed with the any of the low penetration guns, the D1 will have a very hard time dealing with other D1s, the Hotchkiss H35 or its German equivalent the Pz.Kpfw. 38H 735 (f), the T18 frontally, and most tier 3 tanks. The 25 mm is generally the better option, but it should be noted that it has a maximum effective range of 400 m, beyond which it will not penetrate even the weakest of armor. The 47 mm SA34 has the lowest penetrating single-shot gun in the game and nearly useless. However, its HE round has only 1 mm average penetration less than the AP round but deals considerably more damage, making an all HE loadout somewhat viable with that gun. It can reliably penetrate only the most thinly armored tanks (e.g. Vickers Medium Mk. II). Working as a team, it can try to absorb hits while other team members provide the firepower. That's not to say it's invincible by any means. 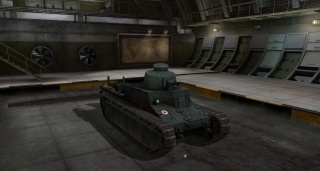 There are guns available to Tier 2 and especially Tier 3 tanks that can punch right through this tank's armor. The turret front and hull front are also riddled with weakspots in the form of vision ports, that can be easily penetrated. Expect to see a stark contrast between surviving countless hits from some enemies and only a few from others. Angling and sidescraping techniques can dramatically increase the D1's survivability in battle. Since the commander is also the gunner and loader, having him knocked out will cripple the D1 immensely. The D1 is incredibly slow, and would usually do well to avoid climbing hills. When stock, it is as slow as the T95. Be sure to pick the correct path to take at the beginning of the game, as the D1 is not capable of relocating quickly at all. Upgrading the turret and gun before the engine slows this tank down considerably. The 13.2 mm Hotchkiss mle. 1930 and the 25 mm Canon Raccourci Mle. 1934 guns carry over from the FT, and are available immediately. The engine is a good place to start researching for an additional 9 horsepower with no additional weight. It is a good idea to upgrade the suspension next. Now research the D1b turret and the 47 mm SA34 gun. Be sure to research the ER 53 radio before moving on. 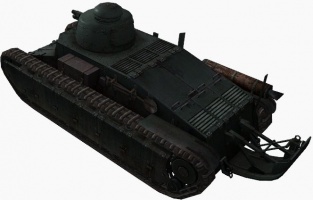 The Char D1's Renault FT ancestry can still be seen from the sloping engine deck and the profile of the side armour plates; it is also still a rather narrow vehicle, only 2.16 metre wide. Its length is 5.76 metre with tail. The riveted hull armour is thirty mm thick on all vertical surfaces, ten mm on top and bottom. 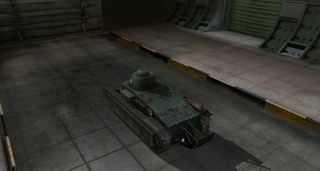 The NC31 introduced a 10 mm protection plate for the suspension units; the lower hull side armour beneath it was probably 16 or 25 mm thick — the exact data have been lost. For its time the Char D1 was relatively well armoured; as a result the hull alone weighs 11 metric tons, rather heavier than a typical light tank of the period. A 74 hp V-4 engine of 6.08 litre renders a top speed of 18.6 km/h; the range is ninety kilometres; it can climb a 110 cm obstacle and a 50% slope, cross a 220 cm trench and wade through 90 cm of water. The type thus had a relatively good mobility for the early thirties. In the hull are two crew members. 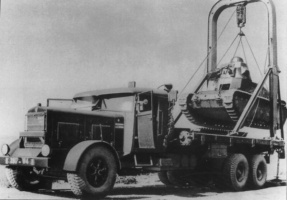 The first is the driver who, as with the Renault FT, is seated below large double hatches that form the nose plates. He can operate, via a steel cable, a fixed 7.5 mm Reibel machine gun low in the nose, that is almost completely hidden behind the armour. The second crew member operates the radio set on the right side of the fighting compartment, the set being an ER (Émetteur-Récepteur or "emitter-receiver") 51 for the NC31s and an ER52 or 53 for the series vehicles. At the right of the engine deck a very distinctive and robust radio antenna frame is fitted, its point the highest of the vehicle at 2.4 metres. It impedes a full rotation of the turret to the right, limiting the total movement to about 345°. The radio operator also assists in the loading of the gun, by handing over rounds taken from the munition load of 76 to the third crew member, the commander, located in the turret. As the ST1 turret type had been rejected, a new one had to be developed. 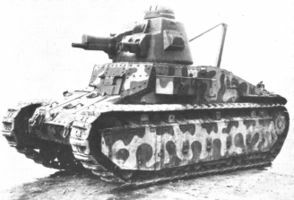 Until it was ready all 160 Char D vehicles were temporarily fitted with existing Renault FT turrets, taken from the Renault FT matériel reserve. Two new turret designs were proposed by Schneider. The ST3 was a modification of the ST1. To solve the balance problem, this type had an armoured extension at the back, with a large square opening. The hatch in the back of the main armour could be opened through the square hole of the extension, providing more room for the commander, who, when operating the gun, would still enjoy some protection against small arms fire, without the weight penalty of a larger turret. The matériel commission judged this system, though ingenious, to be hugely impractical — it made the turret more vulnerable in precisely those situations where it was most likely to be hit: when fighting the enemy — and decided to accept the weight penalty, choosing the alternative ST2 that was simply a larger turret that had more room at the back, weighing three metric tonnes. Nevertheless a single pre-series vehicle was fitted with the ST3 for trials and afterwards used in this configuration by the driver school. This ST2 turret had a very complex geometry with many shot traps. This was partly caused by the large protruding diascopes at the sides, but also a result of forcing the commander to operate in three height levels: he had to stretch himself to observe his surroundings via the cupola, had a forward observation hatch that he could look through while standing in a normal position and had to crouch to operate the 47 mm SA34 gun to the right of him and the coaxial 7.5 mm machine gun to the left. The lower level had its own extension, where extra room had been found in the front of the turret to bring the machine gun forward, while retracting the main gun, thus improving balance even further. Needless to say, the army was very critical of this general arrangement, but it could not be rejected as deliveries were already greatly delayed: the first replacement turrets were fitted only in early 1936. The ST2, weighing 1788 kg, brought the total weight to fourteen metric tons and, costing 100,000 FF per piece, the total vehicle price to 475,000 FF. 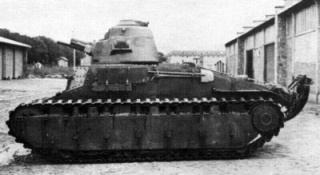 The Char D1 was thus neither particularly light nor cheap, causing the Hotchkiss company to propose a design better conforming to the role of mass produced light infantry tank, which proposal would eventually result in no less than three production types: the Hotchkiss H35, Renault R35 and FCM 36. 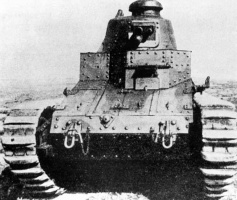 However, even in 1926 the project had been seen as more of a cheaper alternative to the Char B than as a pure light infantry tank; the political situation of the early thirties would force the Char D1 completely into the role of Char de Bataille or "battle tank". 1929 Renault D1 Web page at Chars-Francais.net. Photos, specs, and brief history in French. 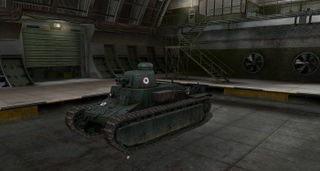 Renault Char D-1 Web page at the MilitaryFactory.com. 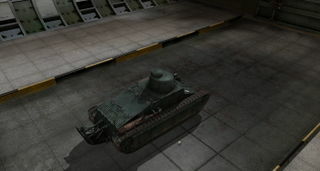 Char Renault D1 Web page at Tanks-Encyclopedia.com. Char D1 Web page at Wikipedia.com. This page was last modified on 3 August 2016, at 09:53.